Macanudo | Chicago's Pipe, Cigar & Tobacco Store | Iwan Ries & Co.
Macanudo was originally the name of a frontmark produced in Jamaica by the makers of the Cuban brand of Punch. 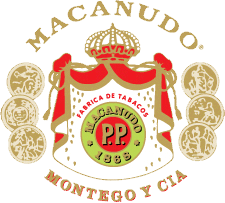 In 1971, General Cigar Company introduced a new cigar named Macanudo as a brand unto itself. Developed in Jamaica under the creative leadership of Ramon Cifuentes, the legendary Cuban cigar master of Partagas, Macanudo soon became the leading premium cigar and remains so today. Now crafted exclusively in the Dominican Republic, every Macanudo Cafe cigar is made with the finest Connecticut Shade wrapper, a flavorful blend of Dominican tobaccos and a select binder grown in the rich St. Andreas Tuxtla Valley of Mexico. And to assure you of the same smoothness in cigar after cigar, the makers of Macanudo use only the most thoroughly aged tobaccos. Every time you light up a Macanudo, you can count on enjoying the same relaxing experience, for this is the cigar that always delivers the same distinctively Macanudo-smooth taste.